Study Spanish the right way. Learn how to develop your own Spanish study guide and learn how to study Spanish on your own terms. If you want to study Spanish, then you’ve probably looked for a Spanish study guide on the web. Chances are that you’ve come up empty handed, underwhelmed or overwhelmed. There’s a good reason for this, though. If you want to know how to study Spanish effectively, the truth is that you’ve got to build your own Spanish study guide. Before you lose heart, though, hear us out. Different people have different reasons for learning Spanish, and not everyone has the same goals in terms of what they want to learn. Some might want to focus on vocabulary, while others might be interested in phrases. Then, too, different people learn in different ways. Some people might be really interested in Spanish grammar, while others might just want to dive into speaking. 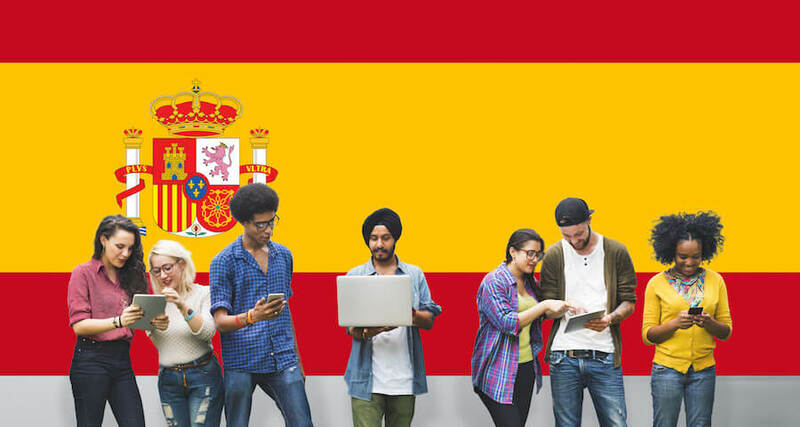 OptiLingo’s free online Spanish course provides a lot of lessons that are designed to help you learn Spanish. That said, one of the best ways to take full advantage of our free Spanish resources is to study on your own using your own Spanish study guide. Are you struggling with Spanish grammar? Are you looking to expand your vocabulary? Maybe you want to practice your accent. The first step in building your Spanish study guide is to decide what you’re trying to learn; otherwise, you’re just taking a shotgun approach, and that’s not very effective. Are you a visual learner? Do you like to pick and chose across different formats? Do you like to use smartphone apps? If you use off-line materials, do you prefer notebooks, flash cards or sticky notes all around your house? Everyone is different, and you need to decide what will help you to study Spanish the best. Depending on your preferred studying method, your concept map might look like hub and spoke, with one concept in the middle and related concepts around it. Alternatively, you might chose to study Spanish using a simple outline. Either way, if you want to know how to study Spanish, you’ve got to organize the content you want to learn before you can study it. Set a schedule, but be flexible. It’s tempting to say that you plan to study Spanish every day for an hour at a certain time, but you may not always be free at that time, and you may not always have an hour. We suggest starting off modestly… say, fifteen minutes per day, and finding time whenever is most convenient, even if it varies from one day to the next. A lot of people are eager to just get their hands on a Spanish study guide and dive in. The truth is that developing your own guide is one of the best ways to study Spanish. By taking the time to think through what you want to learn and organizing it, you’ll be halfway there to mastering Spanish. It might be tempting to binge study when you first start out learning a foreign language, but it’s not sustainable. Moreover, cramming is not an effective way to learn anything, especially Spanish. While we strongly suggest starting out with fifteen minutes per day to study Spanish, we would caution anyone with studying for more than an hour. The worst part of overdoing it is not that it’s inefficient, but that it’s a fast way to burn out and lose motivation.